A new era in F1 has well and truly begun. Jenson Button and Rubens Barrichello have brought Brawn to the front of the F1 grid in Melbourne - the first time a new F1 team has done so since 1970. With new platinum sponsor Sir Richard Branson of Virgin looking on (he cut short a family holiday to attend the race), Jenson Button clocked a 1m 26.202s in the final lap of the third qualifying session to take pole, crushing both his critics and the sceptics who gave the ex-Honda team little chance in the lead-up to the 2009 season. Though Nico Rosberg showed dominance through Q1 and 2, Brawn team-mate Rubens Barrichello, the most senior driver in F1, backed Button up with a 1m 26.505s to take P2 ahead of both Williams cars (Rosberg, P5 and Kubica, P4) and Red Bull's Sebastien Vettel (P3). "The last five or six months for (the Brawn drivers) have been so tough, going from not having a drive or any future in racing to putting it on pole here is just amazing," said Button after Q3. "It has been a long time since we had a car that has been competitive. I put it on pole here in 2006 - it has been very tough and there are a lot of people who stand by you which is fantastic, but there are obviously a few people that don't and they forget and they don't believe. "The important thing is that the people within team believe and that is all we care about. You can say it is a very good car but you still need to get the laps in and make it your own. This is a great moment, but obviously not the most important moment of the weekend. "We didn't know what other people's pace was and you don't until you get to qualifying. They seemed to be a little bit closer than I thought actually in Q1 and Q2, they were one or two tenths behind but I was struggling on low fuel for some reason. I just could not get the car working right, but when we put fuel in it, it felt a bit more normal and in a way that is a good thing as it should help us out in the race. "This morning (Saturday) the pace seemed to be pretty good on both tyres (medium and super-soft), and I was reasonably happy. "I have to give all credit to the team and Ross (Brawn) and Nick (Fry) for making this happen. This is where we deserve to be after the tough times we have had. Barichello was equally appraising of the team's efforts to get the cars to the grid on time. "First of all, I just want to emphasis what Jenson said that it has been a critical three or four months back home waiting for news," he said. "Everyone who has touched this car needs a credit because it is a really good car. My car was fantastic on low fuel, it was really, really good and as you could see I put that fastest lap but then in Q3 for some reason I developed some understeer on the car and we tried to move the wings a little bit more to add a little bit more front wing but that car kept going to understeer, so I was very limited but it was difficult although I think the first row for both is a credit and we must be happy." The youngest driver in F1 history to take pole position, a podium position, and a round win, Sebastian Vettel, brought Red Bull Racing in to third at 1m 26.830s. His Aussie Red Bull team mate Mark Webber clocked the fastest lap in the first half of Q3, but was beaten back to eighth by the end of the session. Though the legality of the controversial rear diffusers of Williams, Toyota and Brawn will be examined at an official hearing at FIA's Court of Appeal in Paris on April 14, both Toyotas were sent to the rear of the grid after the rear wings of the TF109s were deemed to have 'extreme flexibility' and in contravention of the rules. They had qualified in sixth and eighth. Williams withdrew their protest over aero on Ferrari and Red Bull's cars, deciding 'it wasn't in the interests of the sport' to continue. A gearbox penalty had also sent defending champ Hamilton from 15th back to last, but Toyota's tap on the wrist saw him gain two places back. He will start in P18, and promising some exciting overtaking manoeuvres throughout today's race. Hamilton said: "It's a problem, but we just have to get on with it. I am still confident in the team, as always, and I am sure we will have some fun starting back there in the middle of the field." "Of course, we have to fix it (the gearbox). We actually survived Q3, which was very pleasing! We are working to fix it - and if we don't, well, we won't be racing tomorrow..."
The coverage of the race has improved tenfold with open broadcast of the driver-team radio chatter, and publishing the official starting weights of the cars. The cars were weighed after the third round of qualifying ( those who did not participate in Q3 declared their starting weights to officials). See below for full details. Melbourne's weather forecast for today's race is a perfect 25 degrees with clear skies, though drivers are complaining of disconcerting shadows across the track due to the late race start. The AGP will be broadcast live on Channel 10 from 5pm today. Barrichello set the pace in the first two qualifying sessions, but as he found his BGP001 starting to understeer with its race fuel load, so Button found his handling with the edge and poise it had lacked on low fuel. The result was the Englishman's fourth pole, but Barrichello was also fast enough to take the other front row slot. 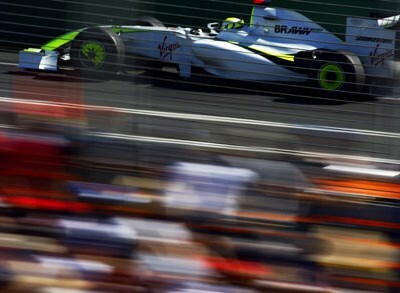 It was the perfect start for Ross Brawn's squad. Vettel had a problem with a wheel nut which hampered his morning running, but in qualifying he banged in a great lap which showed the true promise of Adrian Newey's 'conventional' car. Webber was not happy with his final lap of Q3, as he found his RB5 unsettled in the bumps of Turn Nine. After struggling for grip on Friday the Swiss-German team made good progress and Kubica was able to put some strong laps together, but even he admitted that fourth was better than he expected. Yet he lost grip on his second Q3 run after Rosberg threw dirt on to the track in Turn 14, otherwise he thought third was possible. Heidfeld, meanwhile, was happy enough until he encountered too much oversteer in the final corner and lost his chance of making it through to Q3. He is hoping KERS (which Kubica does not have) will give him an advantage in the race. It was tempting to feel disappointed for Williams to start only fifth courtesy of Rosberg after all his practice speed. He said his FW31 was still nice to drive, and was quite happy, suggesting that the team believe some of their rivals to be running lighter on fuel (though it turns out those ahead largely are not). Nakajima looked okay in Q1 and Q2, but made a crucial error that left him stranded in Q2. Again. Toyota had expected better than sixth and eighth on the grid, but were still fine-tuning the balance of their TF109s right through to Q3. Glock was nevertheless quite happy, while Trulli found qualifying harder than he had anticipated and was ultimately disappointed. His main problem was generating sufficient heat in his Bridgestones when it really mattered. The team was struck a serious blow later in the evening, when the stewards deemed that their rear wings were too flexible and moved both TF109s to the back of the grid. Toyota opted not to appeal. Massa said he could not feel satisfied with seventh place, having aspired to fifth, but that it was the best he could wring from his F60. Raikkonen lost time with a hydraulic problem in the final practice session, which reduced his running time. Both drivers think they are in good shape for the race, and hope that their KERS systems could confer a significant advantage at the start. Almost tongue-in-cheek, Alonso allowed that the plan to fight for the podium might not happen on race day, but explained that a mistake in the penultimate corner may have cost him the chance of fifth or sixth place overall after he failed to make it through Q2. Piquet simply struggled. As they had expected, McLaren struggled in Melbourne. Kovalainen said his MP4-24 was well balanced, but it still lacked grip. Hamilton had the same problem, and another. Fourth gear broke on his second flying lap of Q1, and though he made it through to Q2 he did not run as the team changed the gearbox. That, of course, incurred a penalty, so he was due to start from 20th place until the exclusion of the Toyota moved him back up two spots. Buemi was quite happy with the job he did first time out in a full-blown qualifying session, while Bourdais admitted to a mistake on his second run in Q1 and then to failing to get his tyres up to full temperature during his run three out lap. Ultimately, Force India's position was established in qualifying after the fast runs Sutil appeared to have done in practice. Fisichella still had some brake locking problems, while Sutil rued lack of downforce as the VJM02's main shortcoming.